To tell you the truth, multi cooker is the best electric devise for every housewife, mother, woman. It can make the cooking of tasty and healthy food your favorite and very easy everyday work. You will eat freshly prepared food more often and it won't get too much of your time and efforts. Some people think that multi cooker is too expensive for their family. Let's find out if it is true. One of main advantages of multi cooker is that you put all the ingredients into it at once. You don't have to be at the kitchen while your meal is preparing, stir it often, add ingredients from time to time, and be afraid that your food can be burnt. All you have to do is just put ingredients into the multi cooker, chose appropriate program and time, and push the button. When the dish is ready, multi cooker will switch off and give you a beep. You can prepare lots of different dishes with a help of multi cooker. Also you are able to sterilize utensils and baby bottles into the multi cooker; pasteurize milk at home (when you buy milk from a farm, not in the store) etc. We advise you to choose multi cookers with many programs. They are more expensive but such multi cooker will become your real friend at the kitchen. These multi cookers managed to get into our rating because they all are functional, convenient, easy in usage, of high-quality and, of course, not very expensive. 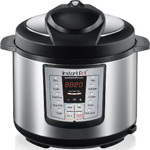 It is third most popular in electric pressure cookers. Multi cooker works as: pressure cooker, rice cooker, slow cooker. Delay cooking timer: 8 hours. Volume: 6 quart (approximately 5.5 liters). Includes: Teflon coated cooking pot, recipe book. Steamer and spoons are able to buy separately. Features: 2 pressure setting (high and low), the lid is removable, has automatic pressure release setting (that makes it save for your hands). Multi cooker works as: pressure cooker, steamer, slow cooker, rice cooker, warmer and saute/browning. Delay cooking timer: 24 hours. Volume: 5.28 quart (5 liters). Features: has 3-ply bottom, has 10 safety mechanisms, rather popular model. 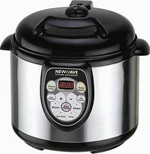 Multi cooker works as: pressure cooker, slow cooker, electric pan/pot, soup/rice cooker, steamer. Includes: non stick removable cooking bowl (sometimes additional bowl are available), stainless steel steam basket, detachable cord, rice serving paddle. Features: 2 pressure setting (high and low) 7 safety protection measures including patented locking system. Multi cooker works as: deep fry, steamer, slow cooker, pressure cooker, rice cooker. Delay cooking timer: + (but it isn't intuitive). Multi cooker works as: slow cooker, brown/saute, steamer. Includes: non stick aluminum removable cooking bowl, steaming rack. Features: glass lid with cool-touch handle, its shape is not round (as in most multi cookers), but oval.